There is a movement afoot these days. Certain groups are establishing themselves as unique in the music world. Call it post-rock, if you will, but change is in the air. The kings of this post-rock movement are without a doubt Sigur Rós, with Sunn 0))) a close second. Yet, with the Metallic Falcons, I think we found the princess if not the actual queen. They are indeed an eccentric lot, musically and otherwise. Imagine if Vas, Dead Can Dance and Celtic Frost suddenly found themselves slathered in Sisters Of Mercy goo. 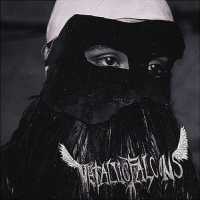 That is the quintessential essence of the Metallic Falcons. Okay, for starters this two piece, all female band consisting of Sierra Cassady and Matteah Baim, with a little help from Jana Hunter, wear cloth masks, feathered headgear and sing of things like snakes, sacred places and pale dogs. That's either very cool, or very weird, or both. They create haunting, spacious lullabies on Desert Doughnuts and also explore stark experimental music. The lyrics are sung in a blurred whisper, with a guitar background that leaks into your brain and takes you on a walkabout into the hinterlands of desolation. The song Snakes And Tea slithers into your psyche, while Misty Song and Desert Cathedral are hypnotic and almost metaphysical. The song Ocean is just plain haunting. However Nighttime And Morning is a subtle soundscape of white noise and eerie vocals. Oddly, some have called this record terrifying. Ok then, when you finish your wheat grass juice and tofu I'll let you in on a little secret, terrifying music is Dimmu Borgir cranked up on 10 (or 11 for you Spinal Tap devotees). This record is cutting edge and one of the most unique musical adventures you could take. I've heard people call this music freak folk, death folk, mystic folk, etc. Labels don't really matter. The fact is that just like Brightblack Morning Light and Sigur R�s, the Metallic Falcons are treading new waters musically. Arguably, there never has been another record that expresses the feelings of emptiness and bleakness better than Desert Doughnuts. Whatever your take on it, Desert Doughnuts will leave you speechless, this is indeed one of the best post-rock records yet created.